Last Monday, Tekno Autosports announced that Adrian Burgess would be joining them as team manager for 2018. The former championship-winning team manager fills a void that’s been open at Tekno since Steve Hallam departed early last year. Tekno has been in a performance slump since Hallam left and will be hoping Burgess’s arrival brings a return to form for the Bathurst-winning squad. Walkinshaw continued to struggle and Burgess and owner Ryan Walkinshaw became increasingly frustrated with the lack of results. In early 2016, Burgess’s contract was abruptly terminated. Walkinshaw continued to tank for the remainder of the year. It was another winless year for Walkinshaw, with Scott Pye’s second at Bathurst their best result. Pye finished the championship in 12th, with Courtney back in 21st, his worst year ever. Burgess, meanwhile, took some time away from the sport he spent the last decade in, before joining Tekno at Sandown in an advisory role. Unfortunately, Jonathon Webb was involved in an accident during the co-driver qualifying race and Tekno could only recover to finish 12th. Hallam first joined Tekno in 2014 after being dropped by Walkinshaw in favour of Burgess. He’d come from a two-year stint in NASCAR at Michael Waltrip Racing, and prior to that, he spent 11 years as Head of the Race Team at McLaren from 1998 to 2008. His two seasons at Walkinshaw were the team’s worst. 2012 was their first winless season and 2013 saw just two race wins for Courtney and one for Tander. He then joined Tekno for two of their best. Driving Tekno’s single car, Shane van Gisbergen finished second and fourth in the 2014 and 15 championships respectively.In January 2016, Tekno won the Bathurst 12 Hour with McLaren 650S driven by van Gisbergen, Webb and Alvaro Parente. Van Gisbergen was replaced by Will Davison, who finished third and first in round two of the Supercars championship at Symmons Plains, Tasmania. Hallam left Tekno shortly after to take up a role at Toyota Racing Developments in California. Burgess was Tekno’s best option to replace Hallam. There are no other team managers in Supercars with better credentials than Burgess. Only Triple 8’s Mark Dutton comes close, overseeing three teams’ and drivers’ championship victories between 2014 and 17. Burgess would have had few other prospects, which would have made him more affordable than the likes of Dutton. Besides Tekno, Nissan Motorsport and Brad Jones Racing might have been options. Burgess probably wouldn’t have fit in at Erebus, a somewhat eccentric team, Tickford tends to only hire new staff at the Super2 level and promote internally, DJR Team Penske is managed by part-owner Ryan Story and Garry Rogers Motorsport by the eponymous owner’s son Barry. Assuming that minnow teams 23Red, Matt Stone Racing and Charlie Schwerkolt Racing can’t afford him, we’re left with Tekno. Considering the results they’ve achieved elsewhere, Hallam and Burgess cannot be blamed for Walkinshaw’s poor form. Walkinshaw’s decline almost perfectly coincides with the passing of its founder Tom Walkinshaw and his son Ryan taking over. Since 2010, the broader Walkinshaw Group business has expanded and diversified, but the racing team has struggled. Ryan had very little involvement in the team until he was forced to take up the role of team principal, and his lack of experience and dedication is reflected in Walkinshaw’s results. For Burgess, Tekno will be a different challenge to the one faced at Walkinshaw. At his three previous teams the objective has been to win races and the championship, and at two of them, he delivered. After three and a half tumultuous years at the terminally dysfunctional Walkinshaw, Tekno will be relatively relaxing for Burgess. Tekno is one of the smallest teams in Supercars, with limited resources. They buy their cars from Triple 8 and only have seven full-time staff. They don’t have the same right-to-win mentality as Walkinshaw and they know they won’t win the championship next year. They will want podiums and race wins, however, and with the right people they can. They’ve proven that already. Walkinshaw’s problem is believed to be that Ryan Walkinshaw is rarely at his team’s Clayton factory. Tekno has no such problems with Webb fully involved in the team. 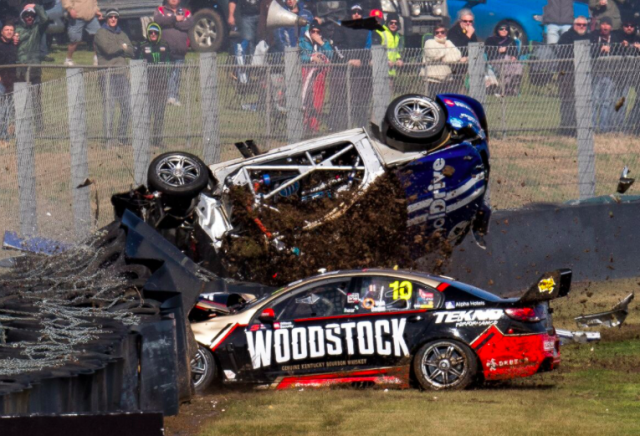 While better than Walkinshaw, Burgess will not have an easy time at Tekno. They will have a new Triple 8-built ZB Commodore and a data-sharing arrangement with Triple 8, but they have lost an experienced driver in Will Davison. It’s likely that rookie Jack LeBrocq will take his place. Finding the right car setup is hard enough with a single car, even harder with an inexperienced driver. Even with Hallam and van Gisbergen, when Tekno was running down the order in Friday practice, that’s where they stayed. When you don’t have a second car to experiment on and try alternative setups, you have had to hit the ground running. Given that LeBrocq won't be a serious championship threat in his first season, and an increased challenge from Penske, Tickford and Erebus, it may be beneficial for Triple 8 to work more closely with Tekno than they have in the past. Tekno can get back to the front with Burgess, just as they did with Hallam. Without an experienced driver like van Gisbergen or Davison, it will be more difficult, but it won’t be impossible.